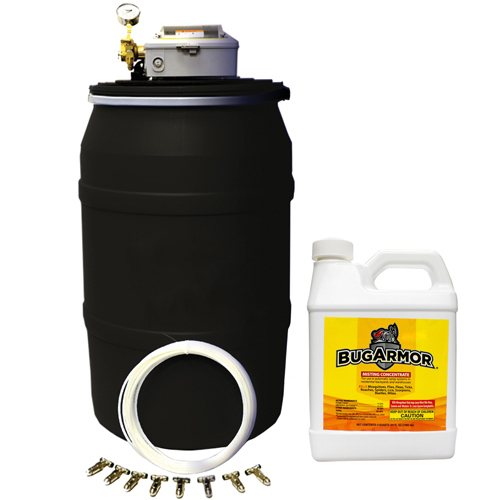 This 55-gallon Automatic Fly & Mosquito Spray System keeps all of those nasty pests away from your horses and livestock! This kit includes everything you need for up-to 8 horse stalls. Keep those pests away from your horses and other livestock. With our fly and mosquito control systems, flies, mosquitoes and many other insects are eliminated in 60 seconds or less. Additionaly, interrupts the breeding cycle and insects can not develop an immunity to this formula. Our fly control systems use natural, safe fly control products. The insecticides are biodegradable, environmentally safe (meets all requirements by the EPA), and are approved to be used around warm blooded animals and humans. *Note: This system is made for up to eight horse stalls, but can be expanded by using additional nozzle kits. - The system is WONDERFUL - we have gone from flies buzzing everywhere to almost no flies. The system works exactly as you said, and installation was relatively simple. Again, thanks for your help and quick response. - Works great, very happy!!! - We are really happy with the fly spray system. Our barn even smells good! Warranty: 1-Year Manufacturer's Warranty. The warranty covers for failure or problems in: workmanship, logged nozzles, fittings damaged from freezing or improper installation, pumps ran with foreign liquids, and timers that have been re-wired. Fly and Mosquito Insecticide sold separately.